Aim—To determine the demographics of hospital admissions and mortality associated with equestrian activities in the 33 000 riders in British Columbia (BC). Method—Analysis of admission data from the Ministry of Health for the years 1991–96, review of information obtained from the Office of the Chief Coroner, and comparison of data from Canadian Hospitals Injury Reporting and Prevention Program. Results—The mean number of admissions per year was 390. Head injury was the most common cause of admission to hospital (20%) in BC. Females most often required admission (62%). Teenagers and children have a higher incidence of head injuries than the general population. The injury rate was 0.49/1000 hours of riding. There were three deaths per year, 1/10 000 riders; 60% were caused by head injury and females predominated. Conclusion—Head injuries and other serious injuries occur with equestrian activities and it is important for doctors, instructors, and parents to promote the use of appropriate safety equipment, including helmets, especially for children. Horse riding is unique in the world of sports because one of the members of the team is not human. The horse has its own athletic abilities and temperament. This athlete weighs upwards of 500 kg, moves at speeds up to 65 kph, and elevates the rider up to 3 m above the ground. The horse can change direction and speed (acceleration or deceleration) in less than a second. When change in direction and speed occur at the same time the centrifugal force is impressive. This team must be in absolute harmony to execute even the simplest maneuvers. The motorcyclist, for example, has a much more predictable partner, although balance and surface conditions are important to both motorcycle and horse riders. Few statistics are available on the number of equestrian injuries. British Columbia (BC), with 75 000 horses, ranks fifth among Canadian provinces for horse population and there are an estimated 33 000 riders in BC (DVM Olson, Agriculture Canada; personal communication, October 1997). The rate of serious injuries in horseback riding has been reported to be one per 350 to one per 1000 hours of riding2 in the USA. This research was undertaken to gain some knowledge of Canadian statistics. Statistics from the Ministry of Health for BC were obtained. The external cause of injury code used was E282.2, which is “accident involving animal being ridden”. 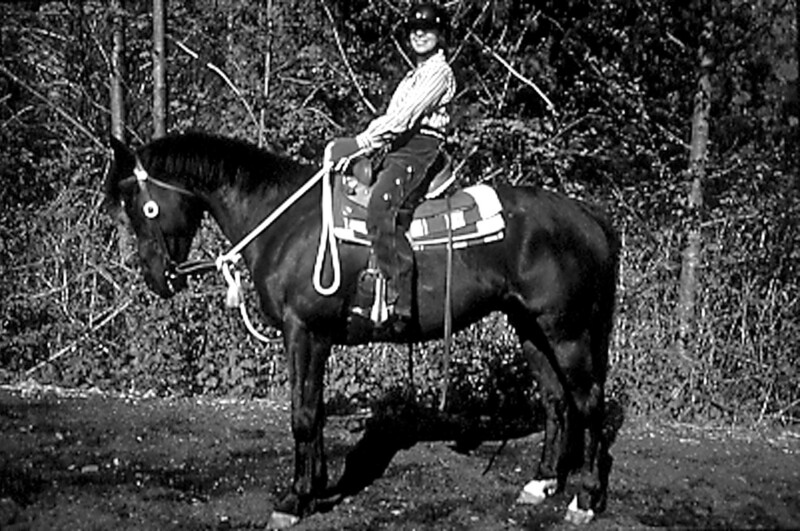 In BC, the majority of animals being ridden are horses. This also includes fall from, knocked down by, thrown from, trampled by animal being ridden, and ridden animal stumbled and fell. The 0.2 part of the code identifies the injured person as the rider of the animal. The statistics include age, gender, diagnostic code, exit code, length of stay, and hospital of admission. Diagnoses were grouped according to anatomical location based on the International Classification of Diseases, ninth revision, diagnostic codes. Exit codes were either death, left against medical advice, or discharge from hospital. To capture all deaths, including those dead on arrival, information from the Office of the Chief Coroner, BC Coroner Services, was also obtained. Ages were totaled in groups from 1–5 years, 6–15 years, 16–34 years, and 35 and older. Length of stay was divided into 1 day, 2–6 days, or 7 and more days. Longer stay usually reflects more serious injuries. There were 1950 admissions from 1991–96, a mean of 390 per year. During these five years 15 people died, nine of head injuries (60%). Sixty per cent of the deceased were female. They varied in age from 4–71 years old. None of those dying of head injury wore a helmet. The 40% of fatalities who did not die of head trauma were either crushed by the horse, drowned when they fell into rivers, or suffered from multiple trauma, including one cougar and one bear attack on the mounted rider. The ages of patients admitted ranged from 1–83 years old. Patients under the age of 16 accounted for 25% of the admissions. Thirty six per cent were 16–34 years old, with the remaining 37% being 35–83 years old. Forty two (2%) were 5 years old or younger. Forty seven per cent per year stayed only 1 day. Thirty nine per cent stayed 2–6 days, and 14% stayed between 7 and 289 days. Females accounted for 62% of the admissions to hospital. The area most likely to be injured was the head (20%). The upper limb was injured 19% of the time. There were equal admission rates for injuries to the lower limb (18%) and the trunk (18%). Spine injuries and spinal cord injuries contributed 7% of the total. Seventeen per cent were unspecified (table 1). The most common type of injury was a fracture (54.2%). Concussions made up 9% of the total. The rest were crush injuries, contusions, and unspecified injuries. Many patients had multiple injuries. The 42 riders less than 5 years of age suffered from a different pattern of injury than their older counterparts. These children had upper limb fractures 48% of the time, head injury 29% of the time, and 22% were lower limb or other injuries. One 4 year old died from a head injury while riding double with her father. The rate of hospital admissions for equestrians was 11.8/1000 riders or, assuming one hour per day riding on average, 0.49/1000 hours of riding. The number of hospital admissions per year in BC and the severity of the injuries, including three deaths per year, indicate that horse riding must be considered to be equivalent to other medium and high impact sports and participants protected appropriately. According to the Canadian Hospitals Injury Reporting and Prevention Program (CHIRRP) data from 1990–95, 14.3% of injured equestrians presenting to an emergency department require admission.4 This compares with a 5% admission rate for other sources of injury. Therefore, an equestrian athlete, injured sufficiently to present to the emergency department, requires careful examination to rule out serious injury. The rate of serious injuries in horseback riding has been reported to be one per 350 to one per 1000 hours of riding.2 The BC study revealed the admission rate to be 0.49/1000 hours riding. Compare this with the injury rate for motorcycle riding, 0.14/1000 hours of riding.2 The injury rate requiring emergency services for skiing is 2.91/1000 days, or assuming five hours/day skiing, 0.6/1000 hours.7 Since admission to hospital would indicate more serious injury than a visit to the emergency department, we conclude that horse riding is more dangerous than either skiing or motorcycling. The E code data is not specific as to type of animal being ridden and a number of bull riders do appear in the BC admissions data, although their number is small. The circumstances of the injury are also not available in most instances. The data for admissions also do not include those dead on arrival. The coroner's data and the CHIRPP data are helpful in clarifying these two areas lacking in the E code data. Aronson H. Tough SC horse-related fatalities in the province of Alberta, 1975–1990. Am J Forensic Med Pathol 1993;14:28–30. Bixby-Hammett DM, Brookes WH. Neurologic injuries in equestrian sports. Sports neurology. Aspen: Aspen Publications, 1989: 229–234. Sorli JM. Equestrian injuries: a survey in British Columbia. American Medical Equestrian Association News 1998;IX(3)May:9–10. Canadian Hospital Injury Reporting and Prevention Program. CHIRPP injury reports. Ottawa: Health Canada, Health Protection Branch, Laboratory Centre for Disease Control, April 1990–April 1995. Chitnavis JP, Gibbons CLMH, Lloyd Parry J, et al. Accidents with horse: what has changed in 20 years? Injury 1996;27:103–5. Nelson DE, Bixby-Hammett DM. Equestrian injuries in children and young adults. Am J Dis Child 1992;146:611–14. Macnab AJ, Cadman R. Demographics of alpine skiing and snowboarding injury: lessons for prevention programs. Inj Prev 1996;2:286–9. Ingemarson H, Grevsten S, Thoren L. Lethal horse-riding injuries. J Trauma 1989;29:25–30.